The rugged PA-2505K Phantom Load operates from a single-phase source and is designed for field-testing single-phase and polyphase watthour meters at 50 and 100% power factor. This unit utilizes a heavy-duty selector switch in conjunction with a variable autotransformer to provide continuous adjustment of the load current - a valuable feature that permits close control of the output for different load circuit impedances or in the event of variations in the source voltage. The unit is rated for continuous duty with forced-air cooling provided by a built-in fan. 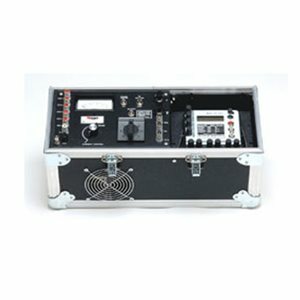 Primary and secondary test leads are furnished as standard equipment.